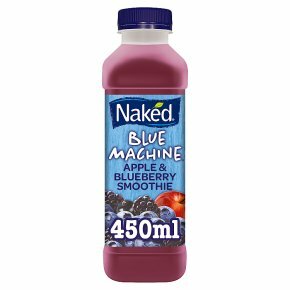 Apple & blueberry smoothie boosted with vitamins B1, B2, B6, C & E. Now with blackcurrant & goji berry. Not from concentrate. Only natural sugars from fruit** **Contains naturally occurring sugars from juice. The Fruit Inside 4 Apples, 2/3 Banana, 55 Blueberries, 4 Blackberries, 12 Blackcurrants, a hint of Goji Berry, a hint of Elderberry The Boost Inside Vitamin C, Vitamin B6, Thiamin, Riboflavin, Vitamin E Don't retreat under the covers with a slab of rocky road, instead try the refreshing taste of blueberries combined with a boost of vitamins C, E, B1, B2 and B6. The Naked truth® Vitamin B6 contributes to the normal function of the immune system. Vitamin C contributes to the protection of cells from oxidative stress.